Many businesses must rely on a social security number verification as a first step to validate a consumer’s identity. Similar to many other courtiers, the United States of America issues a personal and unique identifier also called a Social Security Number (SSN) to help identify and track the US population. The social security numbers are issued and managed by the Social Security Administration (SSA). Businesses rely on social security numbers to make business decisions, create and manage accounts, identify customers, assign new identifiers and track transaction history. The original purpose of the SSN which the Social Security Administration (SSA) started assigning to individuals in 1936 was to track workers' earnings and pay benefits. Since its inception and until 2011, the 9 digit SSN was comprised of a three-digit area number, followed by the two-digit group number and four-digit serial number. The area number reflects the state as determined by the ZIP code in the mailing address of the application. The SSA changed the way Social Security Numbers are issued on June 25, 2011. This change also referred to as "randomization" was developed to help protect the integrity and longevity of the SSN. • The random number will eliminate the geographical significance of the first three digits of the SSN, currently referred to as the area number, by no longer allocating the area numbers for assignment to individuals in specific states. Previously unassigned area numbers will be introduced for assignment excluding area numbers 000, 666 and 900-999. • The randomized number will eliminate the significance of the highest group number and, as a result, the high group list will be frozen in time and can be used for validation of SSNs issued prior to the randomization implementation date. To help businesses identify their customers, the SSA established the Consent Based Social Security Number Verification or CBSV system which allows enrolled companies to pay per transaction as they access the SSA database and verify SSN related information in order to validate the identity components provided by a consumer. As indicated before, SSN verification is just a first step for verifying and validating the accuracy of personal information provided by a person claiming to be their information such as name, SSN, date of birth and gender. The reason why such verification is just a first step is because fabricated personal information provided by an individual may match the information received by the SSA and negatively impact business decisions. Just because the information provided by a person matches the information received from the SSA, it is by no means an indication that the person is who he claims to be because the information may be stolen and documents may be fabricated bypassing the first layer of identity theft detection controls. Even the SSA has a disclaimer on its website by saying that “Please note that the results obtained from CBSV do not confirm or authenticate proof of identity”. 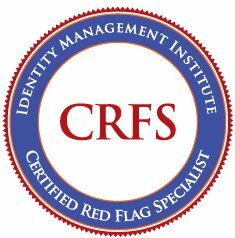 However, well trained employees such as Certified Red Flag Specialists (CRFS) may verify the authenticity of personal documents provided by an individual as a second layer of identity theft detection controls, ensuring valid and accurate information belong to the information provider. For example, if a customer is a male but the SSA data indicates that the SSN belongs to a female, the fraud case is easy to detect, however, if all identity components provided by the customer match the description of the SSN data, then businesses may be less suspecting. As a second and third verification steps, additional documentation or information must be obtained from the customers and other sources, and the authenticity of submitted documents must be established to ensure the information provided is accurate and valid. The Consent Based Social Security Number Verification or CBSV is not a free social security number verification service but rather a service provided by the SSA to enrolled private companies and government agencies. The one-time non-refundable enrollment fee is $ 5000 and each verification costs $ 5. The CBSV provides instant and automated verification of SSN related information and can handle large volumes of transactions. Primarily, CBSV verifies whether a name and social security number provided by a person match the information in the SSA data records. The SSA master file is used by the CBSV system to confirm a person’s name, SSN, date of birth and gender with a Yes or No verification code. The system even reports a death indicator if the person is deceased. Any company can use CBSV for identity verification purposes including pre-employment verification and compliance. For financial transactions, CBSV can also be used for loan origination, acquisitions and collection efforts. One of the major benefits of the CBSV system is that the information provided by the system is not polluted or erroneous similar to other sources of personal information such as credit report information because fake credit information may be created and not be detected by credit bureaus, companies and consumers victimized by the perpetrators. Companies interested in learning more about the CBSV process, its benefits and enrollment process can visit the SSA Consent Based Social Security Number Verification website or email to ssa.cbsv@ssa.gov. Also, if the number of verification transactions do not warrant the enrollment cost of $5000, businesses can partner with enrolled companies which already have a connection with the SSA to verify identities as needed. One such company is Computer Information Development LLC (CID) which has been working with the Social Security Administration on their Consent Based Social Security Number Verification service since 2004. CID is the first CBSV enrolled company to build a direct interface into the SSA Master File and Death Index and provide its clients real time and instantaneous results from its IDValidation web platform. Contact Identity Management Institute for more information about social security number verification.